By 1939, it was clear that the British Air Ministry would not order the Martin-Baker MB2 into production. James Martin (main designer) and Captain Valentine H. Baker had already been at work designing a new fighter aircraft—the MB3. 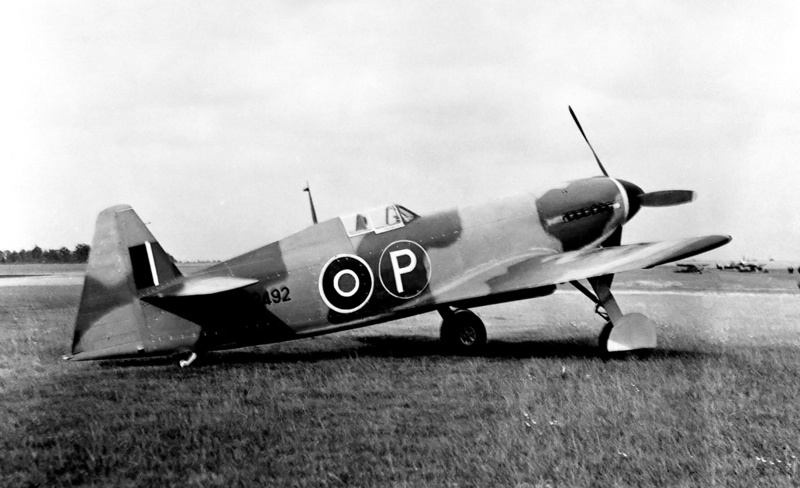 Since the MB2 had proved to be a well-designed fighter, the British Air Ministry ordered three prototypes of the MB3 fighter on 16 June 1939. The new aircraft would be built under Specification F.18/39, issued to Martin-Baker in May 1939. The minimum requirements of Specification F.18/39 were a speed of 400 mph (644 km/h) at 15,000 ft (4,572 m), a ceiling of 35,000 ft (10,668 m), an endurance of 2.5 hours, and an armament of four 20 mm cannons. With the contract issued, Martin worked to finalize the MB3’s design. The nearly complete Martin-Baker MB3 in the summer of 1942 at Martin-Baker’s factory in Denham. The aircraft is not painted, and its six 20 mm cannons are installed. The cannons were removed before flight testing. The timetable for completing the aircraft was rather optimistic for the relatively small Martin-Baker company. The original contract stated the first MB3 prototype was to be ready by 15 December 1939, with the two remaining aircraft completed by 15 February 1940. At this early stage, the aircraft was to be powered by a Rolls-Royce Griffon engine. By September 1939, it was apparent that the Griffon engine would not be available to Martin-Baker for some time. At the insistence of the Air Ministry, the Napier Sabre replaced the Griffon, and the entire aircraft was redesigned for the new engine. This resulted in a new contract that was somewhat delayed but ultimately signed on 11 August 1940. Britain was now fully involved in World War II, and Martin-Baker was inundated with other work of a higher priority. Therefore, completing the first MB3 took longer than anticipated. By the end of 1941, Martin-Baker was informed that there would be no production orders for the MB3, but the first prototype was so far along that it made sense to finish it. Construction of the Martin-Baker MB3 followed the established company practice of using a tubular steel frame to make up the fuselage structure. The main wing spar was made of laminated steel, with the number of laminations decreasing near the wingtips. The rest of the wing structure formed a torsion box of extreme rigidity. The entire aircraft was covered with stressed aluminum skin, but many panels could be opened or removed for quick access to equipment and armament. The rudder was fabric-covered, but the rest of the control surfaces were skinned with aluminum. The MB3 during its brief flight testing career at RAF Wing. Note the retractable stirrup and fold-down door for cockpit entry. The aircraft used pneumatically controlled split flaps and had spring loaded aileron gap seals to increase its roll rate and improve aerodynamics. The elevator also had gap seals. Fuel was carried in a fuselage tank in front of the cockpit. The aircraft’s fully retractable main landing gear had a wide track of 15 ft 5 in (4.7 m). The tailwheel retracted into an open well under the tail. The landing gear was lowered by gravity and raised by a pneumatic system, which was separate from the system that controlled the flaps. Each wing housed three 20 mm cannons with 200 rpg, all installed outside of the aircraft’s main gear. The ammunition belts were installed parallel to the cannons; each bullet had to turn 90 degrees before being fed into the breach. This “flat-feed” ammunition system was patented by Martin. The cannon and ammunition arrangement made for a compact package that could be easily accessed and quickly serviced. With its six 20 mm cannons, the MB3 was one of the most heavily armed fighters of World War II. This image of the MB3 running up gives a good view of the aircraft’s wide-track landing gear and the close-fitting cowling that covered the Sabre engine. Also visible are the under-wing scoops for the radiator and oil cooler. The Rolls-Royce Vulture X-24 engine was also considered to power the MB3. The V-12 Griffon was initially selected because it was a far less complex power plant than the Vulture or Sabre. However, because the Sabre was more readily available than the Griffon and was favored by the Air Ministry, it was ultimately selected to power the MB3. The 2,020 hp (1,506 kW) Sabre II engine had 24 cylinders arranged in a horizontal H configuration and used sleeve valves. The engine drove a three-blade de Havilland propeller that was 14 ft (4.27 m) in diameter. Engine cooling was provided by a radiator installed in the right wing and an oil cooler installed in the left wing. The radiator ran from the wing root to the main gear, and the oil cooler was about half the size of the radiator. The scoops for the radiator and oil cooler extended about 5 in (127 mm) under the wings and were positioned between the gear wells and the flaps. The MB3 had a 35 ft (10.7 m) wingspan and was 35 ft 4 in (10.8 m) long. The aircraft had a gross weight of 11,497 lb (5,215 kg). The MB3 had a top speed of 418 mph (673 km/h) at 20,000 ft (6,096 m). However, Martin claimed that Captain Baker had achieved 430 mph (632 km/h) at the same altitude, albeit without the drag that the six cannons would produce. At sea level, the aircraft was capable of 372 mph (599 km/h), and maximum cruising speed was 370 mph (595 km/h) at 15,000 ft (4,572 m). The MB3’s landing speed was 88 mph (142 km/h). The aircraft had a service ceiling of 35,000 ft (10,668 m) and a range of approximately 420 miles (676 km). This rear view of the MB3 illustrates the aircraft’s fine fit and finish. The aileron and elevator gap seals can just be seen. The first MB3 was given the serial number R2492. The aircraft was expected in March 1942 but was not completed until early August. The aircraft was trucked to Royal Air Force Station Wing (RAF Wing) in Buckinghamshire for flight testing. Surrounded by small fields and many trees, the small airbase of RAF Wing was not an ideal location for flight testing. Martin had objected to using RAF Wing, but the Air Ministry insisted. Captain Baker was at the controls when the MB3 flew for the first time on 31 August 1942. The six wing cannons had been installed when the aircraft was built at Denham (near London) but were removed before the aircraft flew and were never reinstalled. Ballast had been added to simulate the weight of the cannons and their ammunition. Flight testing revealed that the aircraft had excellent maneuverability and handling characteristics. However, difficulty was experienced with the Sabre engine, and engine overheating issues troubled the MB3. Many sources claimed that the MB3 was fitted with a bubble canopy after its first flight. This belief stems from a doctored image of the MB3 with a bubble canopy meant to illustrate what the production version of the aircraft would look like. A bubble canopy was never installed on the MB3. On 12 September 1942, the aircraft made its 10th flight. Captain Baker had just taken off when the engine seized, a result of a sleeve drive crank failure. Low to the ground and without any options, Captain Baker put the MB3 down in one of the many small fields lined with hedgerows and other obstacles surrounding RAF Wing. The aircraft clipped a pile of straw and crashed through a hedgerow at high speed. The MB3 cartwheeled, broke apart, and caught fire. Captain Baker was killed instantly. The death of Captain Baker was a bitter blow for the Martin-Baker company. Martin took it especially hard; he had lost his friend in an aircraft powered by an engine he did not want to use and at a test site that he thought was inadequate. It was not long before Martin and the Martin-Baker company began work to improve aircrew safety and developed a series of ejection seats, which the company still manufactures today. 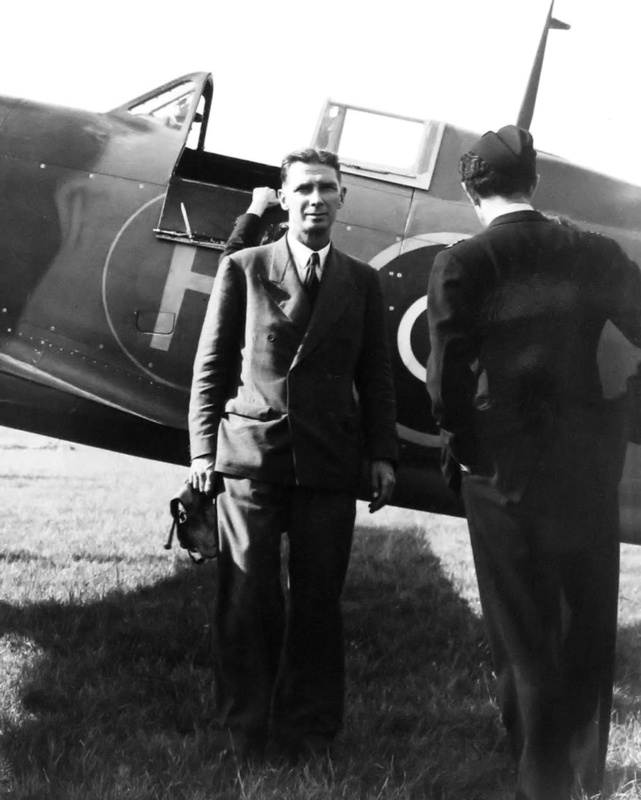 Captain Valentine H. Baker posses with the MB3 shortly before a test flight. The engine seized on the MB3’s 10th flight, and Captain Baker was killed during the subsequent crash landing. With the first MB3 prototype destroyed, Martin’s attention turned to the partially completed second prototype (R2496). Construction of the third prototype (R2499, or possibly R2500) was probably never started. Martin had already designed the MB3A, which was the production version of the MB3. The MB3A had a bubble canopy (that was never fitted to the prototype), and its cockpit was moved slightly forward to improve the pilot’s view over the wing. 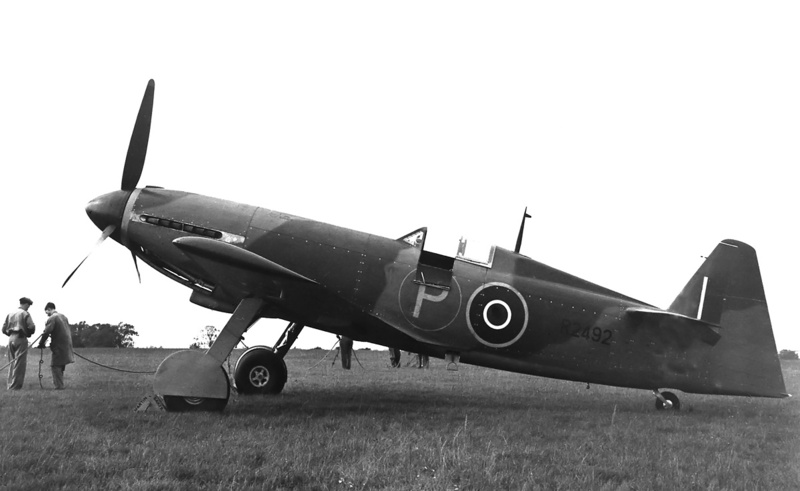 The MB4 had also been designed; it used a Bristol Centaurs engine in the same basic MB3 airframe. 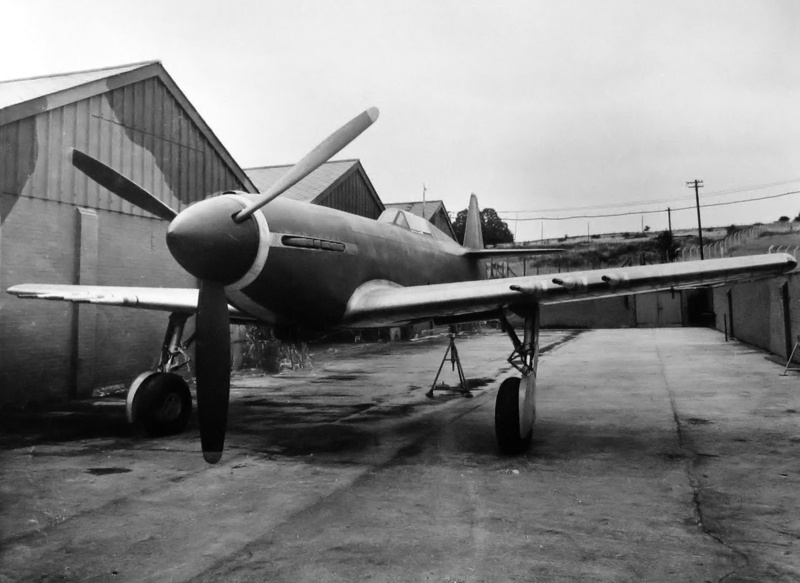 However, since the Air Ministry was finally willing to provide Martin-Baker with a Griffon engine and with the MB3’s performance now on par with existing aircraft, Martin sought to redesign the entire aircraft as the improved MB5 fighter. The Air Ministry was agreeable, and serial R2496 was reallocated to the MB5 aircraft in late 1943. The MB5 flew in 1944 and was another outstanding aircraft. 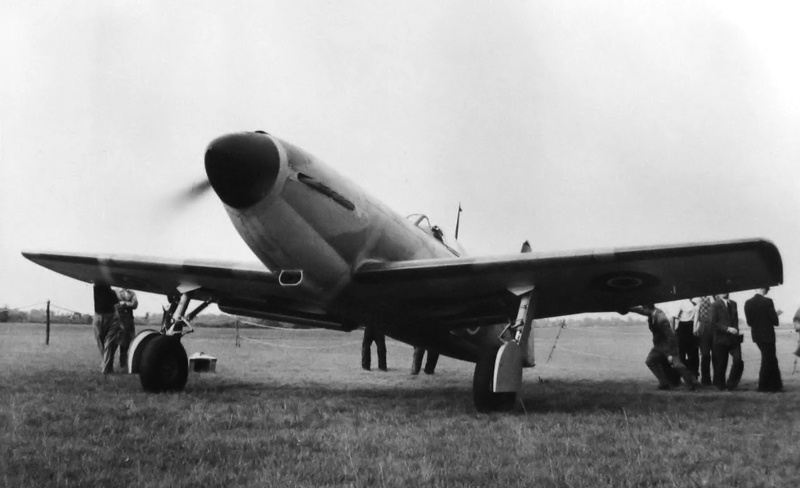 However, the MB5 never went into production, and it was the last aircraft built by Martin-Baker. This entry was posted in Aircraft, World War II on 11 June 2016 by William Pearce. Informative article about a RAF prototype that I have never head of before.